Contributions by Armen Avanessian, Elie Ayache, Amanda Beech, Ray Brassier, Mikko Canini, Diana Coole, Christoph Cox, Manuel DeLanda, Diedrich Diederichsen, Tristan Garcia, Iain Hamilton Grant, Elizabeth Grosz, Boris Groys, Graham Harman, Terry Horgan, Jenny Jaskey, Katerina Kolozova, James Ladyman, François Laruelle, Nathan Lee, Suhail Malik, Quentin Meillassoux, Reza Negarestani, John Ó Maoilearca, Trevor Paglen, Luciana Parisi, Matthew Poole, Matjaž Potrč, João Ribas, Matthew Ritchie, Alicia Ritson, Susan Schuppli, Steven Shaviro, Nick Srnicek, Achim Szepanski, Eugene Thacker, McKenzie Wark, Andy Weir. 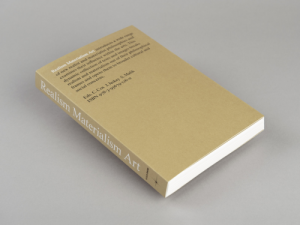 Published in Realism, Materialism, Art, 2015. Art today reeks of a lack of imagination. It is burdened by its own histories, its tales of emergence, its attachment to contexts, its sick love affair with location and the personal histories of “lives’. Identifying art as the great social redeemer aids and abets capitalism as does the private self reflective work of the artwork as personal memoir. Equally, intellectually rigorous art increasingly defends the viability of a labour of the mind. Here, the artist as interdisciplinary “researcher” conducts anthropologically revealing exercises on others, yet the work ends up revealing more about its maker. In general terms, art today is based on an ethics of making and recognizing differences, the problems of which stand as the defining crisis of art’s good conscience. The demand for another art, a different art – one that we long to see – must therefore be taken in distinction to the proliferation of art observing an ethics of difference. It proposes a difference from the proliferation of differences.